Both astrology and other earth-based wisdoms tell us that beginnings are potent moments. This is why we cast charts for the beginning of life and all the other beginnings of our lives. This is why we set intentions at the beginning of the year. Beginnings are seeds. Seeds will grow into solid manifestation. We naturally want to place conscious intention into those seeds. Every New Year I do it, I make at least one resolution, try to create at least one change in my life. Some years, the resolutions have been so extreme that I fail within days. Other years, I try to keep the expectations low and notice that this doesn’t feel right either. The stories we tell about how hard it is to change, how desperate we are to survive winter, how much sacrifice we will need to make to become better people, these stories impact not only the journey through the next year but also the type of outcome we can expect from our seeds. So, we do not ignore Capricorn at this time of beginning. Within this sign is great strength and structure. Structures are systems. Systems can be designed to hold the values that ensure we not only survive but thrive. What system best helps you thrive? I have been investigating this very thing this Capricorn lunar cycle. The three qualities that I know I want to infuse into my beginnings this year are: beauty, liberation, and truth. I am also taking on a word this year to remind me of my intention. The word is “Awake.” I am already noticing some curious paradox about choosing this word, so I know it will be rich for me. The great thing about stories is that they are not fixed permanently. We get to add to them. It isn’t too late to reframe your intentions for the year. We can always awaken, no matter how long we’ve been asleep. Noticing your own stories about beginnings, is there a change you’d like to make? January 4—Full Moon: Illuminating. This Full Moon is asking us to sit up and pay attention. The illumination of the Full Moon comes from the Sun, of course, but energetically the illumination of this Moon phase comes from the fact that the Sun and Moon are in direct opposition to each other. The Moon today is in Cancer, which is opposite Capricorn. We’ve all experienced oppositions in one form or another. Some oppositions feel like a struggle of wills. Other oppositions bring the clarity of seeing something full on. And still other oppositions feel like two sides of a coin that show us different sides to a similar issue. Oppositions are a dynamic stage in a cycle. They represent an extreme moment of differentiation that can bring sudden shifts in understanding. This Full Moon has the potential to be dramatic and important in all these ways. The coin that Cancer and Capricorn share could be called Parenting. Cancer is the parent that provides unconditional support, making sure everyone’s feelings are tended. Capricorn is the parent that has high expectations and lays down the law so the child knows how to be successful. Both signs are concerned with nurturance. Both signs make good managers, both signs want to help the “family unit” thrive. And a family unit can be any grouping of people whose connection to each other is important. Cultures, nations, organizations all fit the bill. The oppositional conflict is in style, which can be framed as the differing styles of earth (Capricorn) and water (Cancer). The important thing to remember about this Full Moon is that no matter what our styles, we all care deeply about our family units and that these units are in need of help right now. 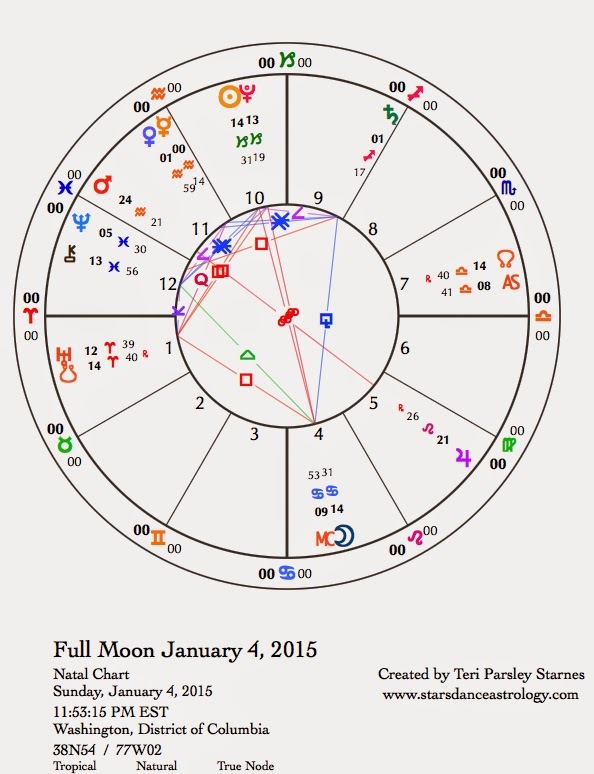 The chart for this Full Moon shows the Sun conjoining Pluto in Capricorn opposite the Moon in Cancer. With the Moon in a water sign, hidden threats from Pluto’s direction intensify emotional responses. Uranus in Aries is square to Sun/Pluto and the Moon. The recent exact square between Uranus and Pluto (December 23) had a strong influence in the U.S. as seen by the upsurge of Black Lives Matter protests. Another reverberation of unrest and a desire for structural change comes with this Full Moon. There is a fated quality to this lunation with the nodes of the Moon being exactly square to the Sun and Moon. The nodes of the Moon represent karma and destiny. Something important is unfolding in the ongoing story of change and transformation. Simply put: pay attention. Choices, attitudes, ways we relate to each other, ways we value other beings, all these things seem very important. That kind of pressure can be overwhelming. This is when self-care becomes a vital practice. If the Capricorn lunar cycle is about reseeding our structures, the Cancer Moon illuminates how to incorporate emotional awareness into the process. The most significant star story of the last couple of years has been the Pluto/Uranus square. Another important transit begins its influence this year and in this chart. Saturn in Sagittarius is nearing a square with Neptune in Pisces. This square won’t be exact until November, but for the next three months both planets are close, within four degrees. Saturn is reining in Neptune’s tendency to dissolve form. Although this transit will have its difficulties (realism vs. fantasy, doubting our spiritual connections, confronting addictions, losing boundaries) it also holds great potential to find spiritual support for creating change in our structures. The conjunction of Venus and Mercury in Aquarius sparks new visions. Though there may be some detachment in our exchanges with others, we are also finding inspiration all around us. It seems to be in the air. Monday, January 5. Imagine circles of nurturance extending around you. Heart gifts are magnified by the care we give first to ourselves. This may feel like the first normal day after the New Year. Don’t be surprised if you are feeling a little tender and overwhelmed by it all. The Cancer Moon may be asking us to slow down and replenish. Mercury in Aquarius is supported by Saturn in Sagittarius. This connection can help us get more clarity about next steps. The future seems wide open for change and innovation and we feel good about being realistic about those steps. Mercury also enters the shadow zone today. This means that soon (January 21) Mercury will station retrograde and will eventually station direct when it reaches this same degree where it is today. This is the first of three passes that Mercury will make over this zone of the zodiac. With Saturn’s help, we can set valuable intention for the entire retrograde period that ends on March 3. Pay attention to communication, learning, technology, and travel. Tuesday, January 6. The Moon in Leo opposes both Mercury and Venus in Aquarius. This opposition shows us two sides to the same coin of Creativity. Aquarius uses detached mental constructs to change the world. Leo uses personal charisma to do the same. We are able to notice differing approaches. Aquarius helps us to see our ego attachments a bit more objectively. Leo infuses dry approaches with passion and fun. The integration of these two methods is essential to fueling the growing edge of transformation in our times. What are you learning? Wednesday, January 7. Let the energy of fire move through stuck places in your life. The Moon is in a fire sign and will be contacting Uranus in another fire sign and Jupiter in Leo (fire) today. Uranus is impatiently questioning us: “Why not wake up? Why not accept that within each of you is a flame of creativity, purpose, and pure joy? Why not wake up right now to that truth?” Sometimes fires need to be tended. If yours seems to be low, find something fun and engaging to do to get that spark going again. Thursday, January 8. The day may start with irritation. The Moon in Leo opposes Mars in Aquarius. The source of irritation could be impatience with those who don’t understand you or are putting up roadblocks for the new world you are fighting for. The challenges may serve to give you more determination. There is always an opportunity with an opposition to understand the other side better. There is always something that links the two sides. How can you pull together rather than against? When the Moon enters Virgo this evening (CST) the mood shifts. A square between the Moon and Saturn could churn up self-criticism. Forget perfectionism (a mantra for me). The best way to use this energy is to make small improvements in your life. What needs your attention most? January 9—Disseminating Moon: Sharing. The Capricorn lunar cycle has us looking at systems and structures, making resolutions for improvements, and committing to hard work. This earth-focused intention is bolstered and challenged by this next phase of the Moon. The Moon in Virgo could encourage extreme criticism. We are in the mood to evaluate everything and if we are stuck in the negative sides of Capricorn or Virgo, nothing will be good enough. If you find yourself here, then this is a moment of choice. It isn’t about not having any standards or not wanting improvement, but it is about whether we want to infuse our structures and systems with the poison of shame. I will say it again, because I say it often: It isn’t about being perfect. This phase of the Moon encourages us to share wisdom. What is the wisdom of imperfection? The Moon opposes Neptune early this morning (CST). We might wake as if in a fog. We might notice that a dream we had last night is telling us something. The balance to achieve under this aspect is one of tempering pragmatism with lofty ideals. Somewhere in the middle is inspiration to serve our desires for improvement. Saturday, January 10. The Moon turns void-of-course this morning and stays in this limbo state for the rest of the day. The Virgo energy that resonates can feed a desire to bring wholeness and balance into our lives. Pay attention to your health. Eating well and exercise feel especially satisfying. Cleaning out clutter will help us feel ready for the next thing on our list. Virgo also encourages a desire to be of service. Infuse this desire with healthy boundaries and an appreciation for small steps making the world a better place. As always, I so enjoy your way of doing and expressing astrology.